Just in case you hadn’t heard, a U.K. blogger, Tallbloke, recently had his home invaded by six police officers who – after approximately three hours – left with two computers and a router, claiming that they wished to “clone” the hard drives as part of their (now two-year old) “investigation” into a “data security breach” at the Climatic Research Unit (CRU) of the University of East Anglia (UEA). Why this could not have been done on site, with far less inconvenience to one whom they’ve declared is not a suspect, and why this “cloning” has not yet been completed and Tallbloke’s equipment returned to him, are questions that one sincerely hopes will be answered in the fullness of time. […] this incident seems to have generated far more interest from the MSM (including the CBC!) than the actual release of the CG2 emails on Nov. 22, and I suspect will encourage even more people to begin their own exercises in due diligence regarding the messages of doom and gloom. Donna Laframboise has summarized these events in her post today (which also includes a fully linked version of a great piece she had written for the National Post, on December 20, regarding the involvement of the US Department of Justice). But one thing that I have not seen highlighted throughout the commentaries I’ve read, is the curious timing of the involvement of The Guardian‘s “features journalist and editor”, Leo <free speech for me and no comment from thee when it doesn’t suit me> Hickman – and his failure to verify prior to posting. Hickman’s partner in alarmism is Damian Carrington (another Guardian “journalist” of the green persuasion not known for fact-checking) who was responsible for The Guardian‘s “exclusive” preview of the notorious October 2010 “No Pressure” video. The invitation generated 225 responses during the “open window” period … which didn’t last very long, as comments were closed at 5:00 p.m. GMT. It is not known how long the E-mail address (to which readers could also direct responses) remained active and/or was monitored. I have been put in contact with a journalist from the warmer side of the UK press. 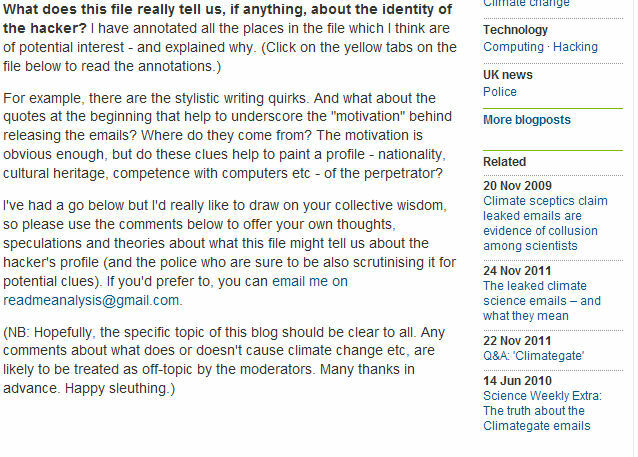 He was interested in knowing about anything which might help discover the identity of the Climategate whistleblower, or as he referred to them ‘ the hacker’, and why ‘foia’ might have chosen ‘the Talkshop’ to place a link to the server where he had uploaded the FOIA2011.zip file rather than another ‘higher profile’ UK climate blog. 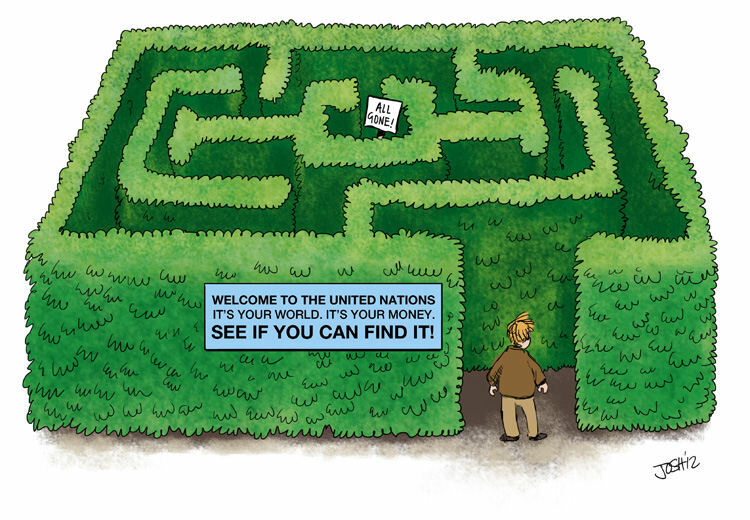 Investigative journalists also have a duty to follow the trail of interdependent public and private bodies and NGO’s which make use of public money, especially when large sums of it are never seen again and no accounting is forthcoming. In my opinion that is the bigger story waiting out there, rather than the discovery of the identity of the person who chose to pull the dirty laundry out of the closet. The investigative journalist in question thanked me for my response, and for my wider views, which I’m grateful he took the time to read, although he chose not to respond to them. When WordPress forwarded this DoJ request to Tallbloke, Jeff (and presumably Steve McIntyre). The police arrive at Tallbloke Towers – and Roger posts the news. Leo asked me in email why my blog was chosen rather than a higher profile uk site. I told him maybe it was because I made one of the FOI requests to CRU back in 2009 and because of this, I was one of the people contacted for a telephone interview by Norfolk police in early 2010. I probably said “some two months” off the cuff from (dodgy post crash) memory. I speculated that because I had commented about that on Climate Audit, FOIA might have chosen me as a recipient for the link comment, or it was just a random blog roll click from another site, or FOIA likes my science. This prompted a rather long and convoluted defensive comment from Hickman an hour later, in which he blamed the delay on “[his] editors”. Finally, at 4:00 p.m., Roger received an E-mail from Hickman indicating that a further change had been made and an additional explanatory note appended. Roger – who, I must say, was far more gracious than I think I would have been in such circumstances – thanked Hickman and closed the thread to further comments. Wait a minute! According to The Guardian … Leo Hickman is a “features journalist and editor” How many “editors” does an “editor” need in order to make a correction to a paragraph that could have been written with greater clarity and accuracy the first time? Well, at least it would have been, had the “features journalist and editor” either read the available material more carefully, or chosen to exercise due diligence by verifying before making such a potentially damaging statement. Had he done so, he could also have spared a few bloggers (of the ultra green persuasion) the embarrassment of having to eat their words (and in at least one instance, eventually remove a post) by which they had uttered a baseless and defamatory assertion. And considering the timeline above, I’d also be very interested in knowing with whom Hickman decided to share the non-published December 5 “interview” noted above. Wouldn’t you? In the meantime, perhaps Hickman should take some lessons from Donna Laframboise, so he can learn how a real investigative journalist practices due diligence and verification – before going to print. Even on the simple matter of the raid at midnight meme, Donna checked with Roger, so that her article (unlike Hickman’s) was right – the first time. I have asked Leo straight out if he had any form of communication regarding me with the police between my email exchange with him (he never told me it was an ‘interview’) and the raid on my home. This raises another question, in my mind: How ethical is it for a journalist to claim that a response to an E-mail question is an “interview”? Thank you for this diligently collated and researched article, and the others you have been working on. It has all been so much of a tumult for me that I haven’t had time to construct timelines, do the secondary analysis etc. Thanks, Rog and the same to you! I admire your equanimity throughout all this – and I sure hope that the tumult dies down very soon, so that you and your family can enjoy the holidays. He denies it?! Well, he would, wouldn’t he?! Mind you, there’s always the possibility that technically he’s correct. But this does not preclude the possibility that he might have shared your E-mail (which became an “interview”, obviously unbeknownst to you) with one or more intermediaries who then shared it with their friends in law enforcement. Pingback: NYT reporter engages in zany conspiracy theory – suggests bloggers “knew” FOIA emails were coming | Watts Up With That? Stay on him. Don’t let any (little or large) inaccuracies slip. They breed like lemmings. Every word with a journalist is an interview. Journalists are the most dangerous creatures in the world. I mean that as a compliment. No doubt it is … and no doubt some of them are … although some of my best friends are journalists! All of that being said, it was Hickman’s misleading lead paragraph – and (giving him the benefit of the doubt) failure to verify, compounded by the length of time it took to correct – that was the most problematic from my perspective. Incidentally there has been a tremendous craporama about what has happened and where it originated – mostly by James Delingpole blaming “Obama’s boot boys”. The DOJ request was standard boilerplate stuff in support of bilateral treaties with the UK – the request undoubtedly came from the Norfolk Constabulary as yet another belated attempt to find out the dastardly person who is making a civil servant (Phil Jones) and his colleagues look bad by actually quoting their own words. But it’s unlikely that Delingpole will be blaming “The Queen’s Boot Boys” any time soon. I don’t know who FOIA.org is, but frankly I would like him/her/them to make contact and at least have a conversation about the balance of the emails and what they might contain – beause who FOIA is is none of my business or interest.